There is no denying the incredible power and value of a high-quality stamp. They allow you to leave behind thousands of vivid, crisp impressions on a variety of surfaces with a simple push and release method. Save your hand the strain and improve readability with a high-performing Trodat clothing stamp! 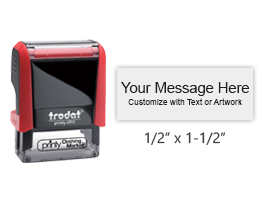 Trodat is one of the leading brands in the stamp industry and for good reason. They continue to create high-quality stamps that are easy to use, long-lasting, and impressive in performance. Their Trodat clothing stamp can be used for a variety of purposes such as marking ownership, dry cleaning information, and more. Best of all, we can customize it to meet your needs! Need special information, a name, or address customized into the rubber image area of these stamps? Let our skilled team create something just for you! In addition to the Trodat clothing stamp offering thousands of crisp impressions, it leaves behind an impression that will last for up to 40 washes for added peace of mind. The body is designed to provide ample support to the wrist during stamping, even during repetitive stamping, and the handle itself is shaped to offer a comfortable grip with every use. We also offer the needed replacement ink for this type of stamp. The ink is available in black only for improved legibility and offers smudge proof, clear impressions with every use. The ink is fade proof at temperatures up to 90 degrees. When you need a reliable stamp and the ink to go with it, this trusted brand is the best solution. Add one of these great clothing stamps from Trodat to your collection today! At Rubber Stamp Champ, it is an honor to be your destination for a wide range of stamp types and related products. We have spent the last twenty years dedicated to serving our valued customers with the best brands in the business, the most affordable prices, and the best in high-quality laser engravings. If you have any questions while shopping with us, we would be happy to assist you in any way. Impression Size: 1/2" x 1-1/2"